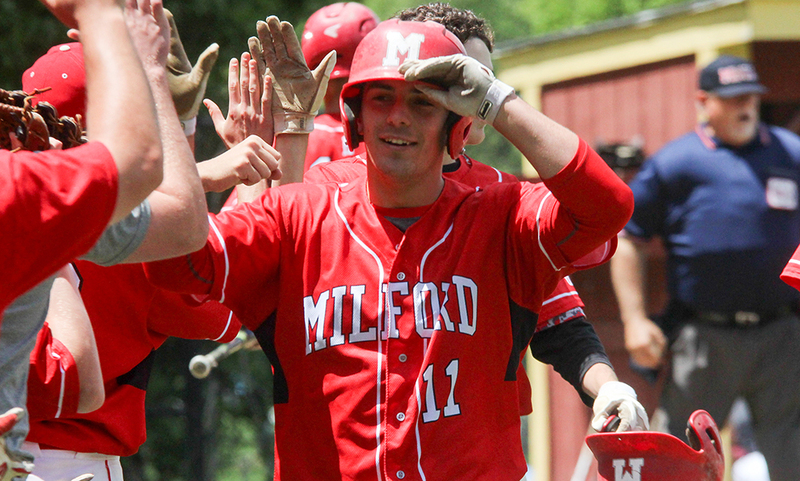 Mansfield, 10 vs. Foxboro, 3 – Final – Click here for a photo gallery of this game. – Mansfield held a 2-1 lead through four innings of play but scored eight runs in the final three innings to pull away from Foxboro. The Warriors scored in the first inning as Anthony Mollica walked, advanced to second on a passed ball, took third on a ground out, and scored on an RBI triple by Joe Cavaleri. Mansfield answered back with two runs in the top of the second. Kyle Moran led off with a double and Eric Longley reached on an error. Both advanced on a wild pitch and Moran scored on a groundout from Nick Dumouchel. Longley scored on a double from Connor Smith. In the fifth, Sam Nugent reached on an error, stole second and third, and scored on a sac fly from Dan Saraceno. Jake Gerraughty, who walked and stole second, scored on an RBI single from Moran to make it 4-1. Tim Rockett (John Carney single), Doumouchel, Chris Jenkins (3 RBI), and Nugent scored in the sixth inning while Will Giffen and Brandon Kemp came around for runs in the seventh inning. Moran got the win for the Hornets, allowing three hits and one walk over five innings of work, striking out eight eight one earned run allowed. Foxboro sophomore Cam Prescott had a solid outing, allowing five hits and one walk in five innings of work, striking out three with five runs allowed but just one of them earned. King Philip, 3 vs. Sharon, 2 – Final – Click here for a photo gallery of this game. 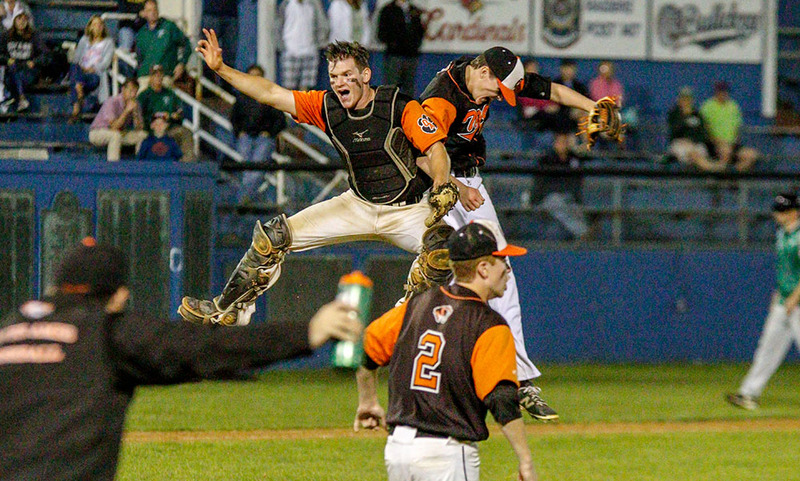 – Sharon loaded the bases in the bottom of the seventh but could only push across one run as the Warriors escaped the new Taunton turf field with a win. Junior Alec Filipkowski brought in a run with a sacrifice fly but KP starter Terry Murray (CG, 5H, 1BB, 2R, 0ER, 5K) got his fifth strikeout to end the game. KP sophomore Jake Silveria singled and took third on an error and scored on a double from Zach Zarba to make it 1-0 in the second inning. KP added two more runs in the top of the fifth. Tom Weir reached on an error, stole second and third, and scored on an RBI single from Robbie Jarest. Jarest stole second and took third on a pop up, then came home when a throw from the catcher back to the pitcher got away. Sharon got on the board in the sixth as Filipkowski got to second on a two-base error and then came in to score on an infield error on a hit by Jared Reef. Sharon junior Max LeBlanc pitched a complete game, striking out six while allowing four hits and two walks. He allowed a total of three runs but just on earned. North Attleboro, 4 @ Taunton, 6 – Final – Click here for a photo gallery of this game. – In a back and forth contest, Taunton scored three runs in the top bottom of the fifth and added an insurance run in the bottom of the sixth to get the win. North jumped out to a 2-0 lead, scoring in the first inning (Evan Melo walk, stolen base, to third on Danny MacDougall fly ball, scored on Josh Lajoie’s RBI groundout) and in the third inning (Lucas Martins walk, to second on Gavin Leahy grounder, and scored on an infield error). North cut the deficit in half with a run int he top of the fifth (Russell Dunlap walked, took second on a wild pitch, to third on Shawn Watters sac bunt, scored on two-out single from Jake Palmer). Taunton had an immediate answer, plating three runs in the bottom of the inning. Martins walked and stole second. Leahy reached on an error and Melo hit an infield single to load the bases. Lajoie was hit by a pitch to bring a run in and Logan Lawrence drove in a pair with a single. North Attleboro made it a one-run game with three run in the top of the sixth. Kyle Briere walked and came around to score on a single from Dennis Colleran, and Watters drove in two with a two-out single to make it 5-4. Taunton added an insurance run in the bottom of the sixth when pinch runner Curt Marshall (running for Colby Lariviere after a double) came home after a throw from home sailed into the outfield when Martins stole second. Lajoie got the win, striking out nine in six innings of work, scattering five hits and two walks with four runs allowed. Justin Rollo earned the save with a perfect seventh inning. Colleran (5.2 IP, 5H, 3BB, 6K, 6R, 2ER) was solid in his season debut. Mansfield @ Holliston – Postponed to TBD.